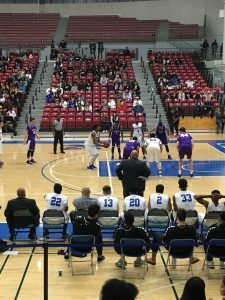 The CSUSB Coyotes men’s basketball team’s hot start seems to be cooling off after being defeated in five of their last seven games. After starting the season with a record of 5-2, the Coyotes have fallen to 7-7 and 3-6 in conference games. The season has had its ups and downs due to some significant injuries, and new players getting adjusted to each other, which has led to a season record worse than the team would like to have. “This year we have shown glimpses that we have the ability to be one of the best teams in the nation,” said center Phil Reed. “We haven’t had the record that we wanted so far, but I am proud of my teammates because every game we lace up and go to war with every single team,” continued Reed. The team started the season by playing an exhibition game against the Fresno State Bulldogs, losing 69-76. They then lost their official season opener in an overtime thriller to the Central Washington University Wildcats by a score of 84-89. They were able to comeback and win their next three games against Concordia University (Oregon), the Academy of Art and Saint Martin’s University. The Coyotes then lost their first CCAA (California Collegiate Athletic Association) game to Cal State San Marcos by double digits. 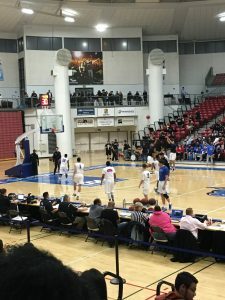 After failing to win their first CCAA game, they were able to bounce back and win the next one against Cal State Monterey Bay by a score of 67-54. The Coyotes then lost their next two CCAA games against UC San Diego and Cal Poly Pomona putting them behind in the CCAA with a record of 1-3. They were able to get back on track and win their game against Stanislaus State, 59-56. But this win was short-lived as they would drop their next three CCAA games. They lost three straight to Chico State, Sonoma State and San Francisco State, dropping their overall record to 6-7 and their conference record to 2-6. They needed to win their next game, which was also against the San Francisco State Gators, to halt their three game losing streak. On Jan. 18 the Coyotes played the Gators and were able to get a win in a hard fought battle on a game winning buzzer beater from Khleem Perkins. This was a big win to put them back in the playoff picture. “We are confident going into our next game against San Marcos after our last win against San Francisco,” said guard Everett Turner. The Coyotes can credit their stout defense for keeping them in contention for the conference tournament. They are forcing turnovers at an outstanding rate with almost 10 per game. “The changes that we have made on defense has allowed us to put more pressure on our opponents,” said Turner. It may only be the halfway mark in the season but this team already has their sights set on the playoffs. They have all the talent they need, now it is just about putting the pieces together to go on a championship run. “As far as playoffs go, I believe we’re more than capable of making a run,” said guard Dylan Leonard. “Our league is very competitive so you really never know who is in or out until the last minute,” continued Leonard. The Coyotes have six more home games throughout February with lots of great theme nights and promotions to check out.